The complex is set to offer outstanding accommodation alongside high investor returns, with values predicted to rise by 35% on today’s prices before completion at end of 2017. The Rt. Hon. 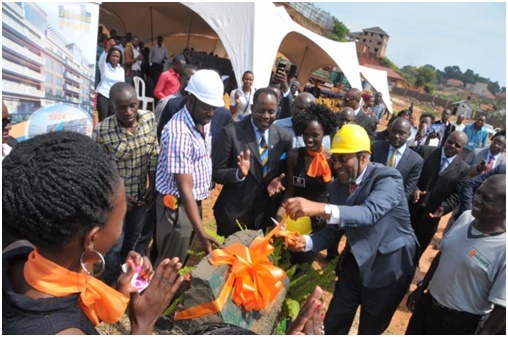 Mr Rugunda recently celebrated the groundbreaking for an ambitious and prestigious new apartment development in Buziga, the first of its type for the area which will provide a new lifestyle concept for the Ugandan capital of Kampala. Marking the launch of the development the Prime Minister recognised the importance of such a development to Kampala’s economic growth and future business success. The development is a first for Buziga where this type of luxury accommodation has not been available before. The 76 apartments, including five penthouses and 71 one, two and three bedroomed homes, takes advantage of one of the highest points in Kampala, boasting spectacular views across Lake Victoria. Jakana Heights affords a landscaped garden setting, extensive leisure facilities including a pool, gym and exclusive clubhouse. Offering a new lifestyle concept, the complex will also provide occupants with high quality business and event facilities alongside on-site shopping for residents. The design work was commissioned for the international development company ProAfco Developments Ltd by a Ugandan architectural team who envisioned building a complex to meet family life and business life needs all within the one site. The complex combines this lifestyle ambition with quality leisure and social facilities. “The project was specifically designed for the growing Kampala business community and their families as well those living outside Uganda wishing to have a home from home on regular visits or for their future retirement. “Our research showed a high demand for a new approach to home and business life which was not being catered for in Kampala. At the heart of making this a possibility was finding the perfect location, one that offered easy access to the city while benefitting from beautiful surroundings and open living. Jakana Heights provided the perfect spot and the inspiration for our development”. The property is set on an exceptional site commanding stunning views, landscaped gardens and easy access to the centre of Kampala. The land was originally owned by Dan Jakana who has partnered with ProAfco to develop the site. The complex’s name has a double meaning, taking Dan’s family name creating a memorable legacy for his mother and also the name of the well known local bird representing the freedom and natural beauty that has inspired the design and ambition of the development. The style of the complex has taken elements of African and modern aesthetics as its guiding design principles. Every attention has been paid to detail to provide a comfortable home but with a sophisticated design. Nearly 20% of the apartments have already been reserved off plan including one of the exclusive penthouses. Expert predictions rate the home’s value well above the current average market with an expectation that the apartments’ value will rise by at least 35% by the time the property is completed at the end of 2017. Experts who have valued the development expected yields to range up to 15% on the current prices. Starting prices for a condo apartment are from $125,000.